The classrooms ... arranged along the central ‘shared play corridor’. Pallavi Dean Interiors worked with GAJ to design the interiors of Sharjah English School’s new facility, in line with modern pedagogy methods for tiny tots, says ABDULAZIZ KHATTAK. Dubai-based interior design studio Pallavi Dean Interiors (PDI) was tasked with creating the design for this space which caters to students from kindergarten to Year 2. Godwin Austen Johnson (GAJ), a leading British architectural and design practice in the UAE, in collaboration with architect Graphite International and PDI, the interior designer, were responsible for the design and managing the building of these additional facilities at the school in Sharjah, UAE. Al Serh Al Kabeer Construction Company was the main contractor. Sharjah English School is located in University City with easy access from Sharjah, Ajman, Mirdif and parts of Dubai. Its new block is an 18,000-sq-ft single-storey building housing six kindergarten classrooms and six Years 1 to 2 classrooms adjoining the outdoor play decks. PDI was awarded its contract in January 2017 and completed it in October. Sun tunnels bring natural light into the corridor. Christina Morgan, director interior design at PDI, says that the school’s existing grounds and neighbouring teaching blocks, which were originally built in the 1990s, have outdated modern approaches to pedagogy. And so PDI was asked to provide a new modern teaching space with a sense of openness and collaboration, allowing children to ‘free flow’ and explore their own environment in alignment with the British Curriculum that encourages self-growth and discovery. The shared spaces, which include the reception, staff offices and sports hall, are all linked by indoor play/collaborative areas. Morgan says PDI’s material approach uses a neutral and natural base palette, allowing student artwork to be displayed without competing against, or over-stimulating the core environment. Colour is used in accents, for orientation and code identification, to help frame and identify the classroom entrances and play zones. The kindergarten classrooms, she says, are linked in two ways: to improve efficiency, but also to encourage cross collaborations between the six class groups. The neighbouring classrooms are connected by a shared ’wet utility zone’ split into water closets (WCs) and then a water play/art zone. “The classroom rows are then arranged along the central ‘shared play corridor’. This space is lined with storage and activities that help support the curriculum such as a hideaway play house, a mini stage area and a computer ‘touch down’ pocket,” she adds. 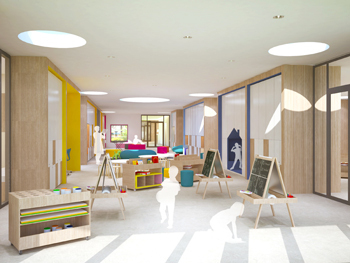 The open play concept, where children can explore and choose their own space for play, is similar to open-plan office designs, where co-working verses individual working spaces are considered. “In Sharjah English School, we have designed out the idea of a traditional school corridor being used just as a thoroughfare, and redefined the corridor as an 8-m-wide flexible light space for exploring, creating and learning together,” Morgan continues, adding that skylights and sun tunnels have been used throughout the space to bring natural light into the deep corridor. 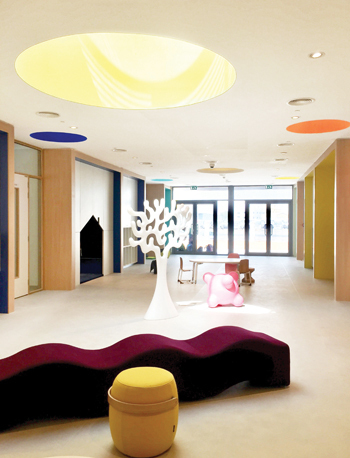 The corridor ... a 8-m-wide flexible light space for exploring, creating and learning together. Materials for the project were sourced locally and internationally. The joinery is locally made, while the resilient acoustic floors have been imported from Europe to ensure international FloorScore/green guide standards for low VOC (volatile organic compounds) content. The upholstery fabric was specified from Camira Fabrics of the UK and is fire retardant and highly durable for school usage. Commenting on the challenges of the project, Morgan says the interior of the project heavily relied on integrated joinery and storage. “Coordinating the quality of this with the base build structure was sometimes challenging,” she says. Commenting on the inspiration behind the project, Morgan says, schools are inspirational places and so is designing them. “From the age of three, we start to develop our sense of self and the world around us, forging those childhood memories that stay with us forever. 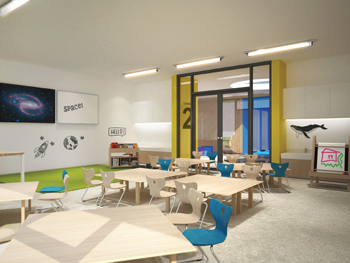 To think our design will have a direct positive impact on how a child learns, feels safe and is connected to their environment is what drives our passion for school design,” she says. PDI’s guiding principle in designing is always the experience of the people who will use a space – in this case. the students of the school. “Our mantra is ‘Create experiences through design’, and we live and breathe that. That means doing lots of research before a line is drawn or a brick is laid, to really understand the users of the space, in some cases better than they understand themselves. “Once we’ve done the research, then the fun starts! You need to play as a designer, you need artistry, flair, creativity, and we’ve tried to create a culture where creatives thrive,” Morgan says. Launched in 2013, PDI has a multi-sector portfolio – hospitality, commercial, residential and education – and believes this experience, and especially with commercial office design positively informs its approach to modern education design. In September 2017, the firm won Boutique Interior Design Firm of the Year at the Middle East Commercial Interior Design Awards. Its flagship projects include the Sheraa entrepreneurship centre at the American University of Sharjah, Edelman head office in Abu Dhabi, and the forthcoming Delano Dubai hotel. In addition, PDI will be rolling out two homegrown restaurant concepts in Sharjah, one of them with celebrity Lebanese chef Maroun Chedid. The other is a confidential education project that’s expected to make waves not just regionally but globally when it’s unveiled, says Morgan, without revealing details.